The Harry Potter video games are pretty fascinating. It's a series with radical shifts in tone, mechanics, genre, and target audience over more than a decade, despite more or less taking place in the same location and starring the same characters. Even more fascinating is that, with some exceptions, you can tell that these games are made by fans of the books with passion for the source material. Even the bad games are failures as adaptations or as entertaining games, rather than a failure to understand what made the books and films so special to millions of people around the world. There's one problem, of course: this series is huge. As far as unique entries go - versions of each game that are suitable candidates for individual analysis, as opposed to just ports of the same game to another platform - there are 23 games just based on the movies released between 2001 and 2011. That's not counting Harry Potter: Quidditch World Cup and the version for Game Boy Advance, the LEGO Harry Potter games, their handheld versions, Wonderbook: Book of Spells, Wonderbook: Book of Potions, Harry Potter for Kinect, and if we're being really generous, I guess we can consider Pottermore a web-based video game too. Of course we won’t be looking at every version of every game. I’m not completely crazy, only partially. Instead, I’ve chosen one game for each film plus Harry Potter: Quidditch World Cup, for a total of nine games, which I think is a nice selection without going overboard. So, without further ado, let's get started with the GameCube version of Harry Potter and the Philosopher's Stone! When creating a movie tie-in game there are, generally speaking, two different ways to approach adapting the movie's story. The first, and most common, way is to treat the story as window dressing, presenting it in cutscenes interspersed with whatever gameplay the designers want. The second option is to make the player feel like they're playing the movie, recreating action scenes from the film within the levels and telling a more accurate version of the film's story. The Harry Potter video games generally strike a compromise between these two styles, with varying degrees of success. In the case of the GameCube version of Philosopher's Stone, the way it adapts the story is the first of many failings. The way the story is presented is incredibly fragmented, with pieces missing, allusions made to events that never occur, and dangerous assumptions made about how much the audience is familiar with the world and characters. This particular point is a cardinal sin in my book, even as someone who is quite familiar with the source material: skipping character development or proper introductions because you know the audience knows the characters is a sloppy, lazy writing shortcut. It's like listening to a popular song, except the only lyrics are those two lines from the chorus that everybody knows. While it's quite tempting to rip apart the story piece by piece, this review is going to be long enough as it is, so instead, I'm going to focus on a few specific examples. The most obvious is a scene from the book where Harry and Ron read about a break-in at the wizard bank Gringotts. The most critical point of that scene is that the vault being robbed was the same one that Hagrid had emptied while getting Harry his spending money for school. Not only do Harry and Hagrid never go to Gringotts at all in the game, but Harry talks about the event as though he did. There are other head-scratching choices that are less of a handicap to understanding the plot, such as the decision to include Peeves the Poultergeist, who was cut from the films as being unnecessary, then doing absolutely nothing with him, not even as a boss fight. Overall, while there are some good narrative choices, the adaptation fails to properly convert the story of either the book or film into a satisfactory action-adventure game. Harry Potter and the Philosopher's Stone manages to mess up even its simple presentation. There are some very noticeable framerate issues, with the game frequently dipping below 30 frames per second despite running natively at 60. I also noticed quite a few blatantly unfinished parts of the game, such as character models with missing textures, or one especially bad sequence where Ron teleports out of a cutscene in full view of the camera. 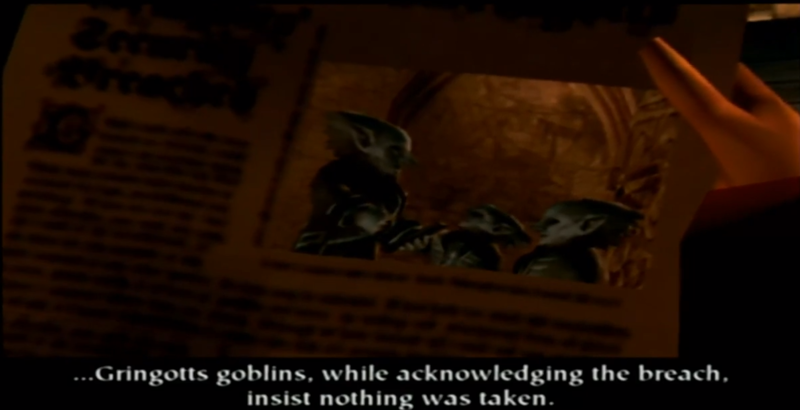 The nasty bugs, improper lighting, bad sound mixing, and low-quality textures make the game look substandard even for a GameCube launch title, let alone a game from 2003. For reasons I don't have time to explain here, the GameCube version of Philosopher's Stone came out one year after the game based on Harry Potter and the Chamber of Secrets. 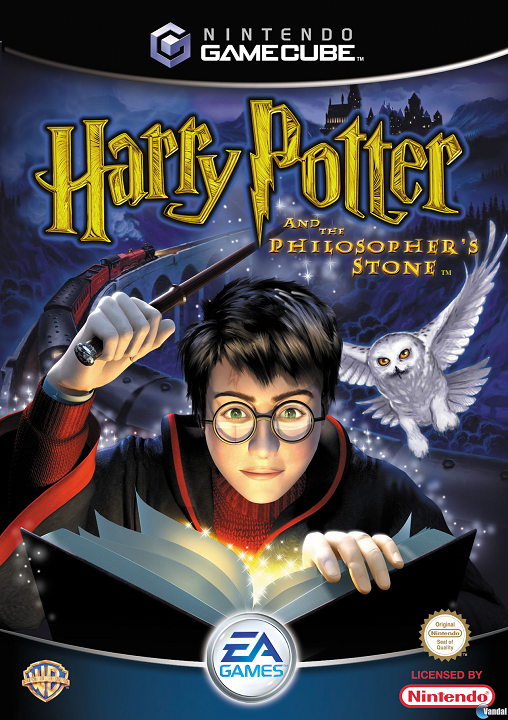 As such the games share a similar engine, though Philosopher's Stone was made by a different developer, and it shows. The base gameplay between the two is the same - Hogwarts is treated as a giant "overworld" where Harry learns new spells in classes that resemble dungeons from The Legend of Zelda. The game also allows Harry to fly around Hogwarts on the Nimbus 2000, which is interesting at first though becomes tedious once the barren Hogwarts landscape wears out its welcome. It quickly becomes clear that the gameplay in Philosopher's Stone is far less polished. Casting spells feels clunky, and several spells, such as Diffindo and Spongify, must be charged before use. The game tries to adapt the Zelda-style lock on combat, but the camera never compensates to focus on the enemy Harry is targeting, leading to many situations where Harry will be blinding firing spells at an enemy the player cannot see. The puzzles in the various dungeons range from too easy to unintentionally difficult due to bad design. I ended up having to use a guide for the last half of the game because the level design did an exceptionally poor job of guiding the player where to go. There are also stealth sections, which are terribly designed, with randomly spawning guards that make strategy pointless. I ended up blindly running past them again and again until the AI decided to act stupidly for one session. Needless to say, by the time I got to the end boss fight against Professor Quirrel, I was more relieved than happy to see my playthrough end. While I normally don't like being so blunt in my reviews, the GameCube version of Harry Potter and the Philosopher's Stone is garbage. It looks bad, plays even worse, and is somehow technically inferior to Chamber of Secrets despite the GameCube version of Stone coming one year later. There is no reason to track down this game, as the PlayStation and PC versions, while flawed, do a far more amiable job of capturing the magic of Hogwarts. Thanks for this review. I had no idea there were all these Harry Potter games. I thought I had everything covered with my two Lego games. Not sure I want to even undertake these others. VideoGameCritic wrote: Thanks for this review. I had no idea there were all these Harry Potter games. I thought I had everything covered with my two Lego games. Not sure I want to even undertake these others. The games vary in quality, though the GameCube version of Stone happens to be one of the weakest in the series. Just out of curiosity, why review the GameCube version if it's a bad port? Wouldn't it be more worthwhile to review a better, more representative version and include a warning about this one? Thanks for suffering through this terrible game for the rest of us. Just as a side note, this game is called Harry Potter and the Sorcerer's Stone in the US. I'm not too familiar with the Harry Potter series, but for whatever reason, the book's name was changed in the US, so the movie and game also go by that name in the US. Stalvern wrote: Just out of curiosity, why review the GameCube version if it's a bad port? Wouldn't it be more worthwhile to review a better, more representative version and include a warning about this one? I happen to have bought it many years ago, I couldn't find a copy of the PlayStation version for a good price, and the PC version is notoriously difficult to get running on recent OS's like Windows 8 and Windows 10. Plus, copies of the GameCube version of Stone are quite rare (if I recall correctly Stone is the only 6th-gen game in the Potter series that didn't get a Player's Choice re-release to mark 1 million copies sold) so I thought it would be interesting to review it, no matter how bad the actual game is. Retro STrife wrote: Thanks for suffering through this terrible game for the rest of us. The book's name was changed at the behest of the American publishers, Scholastic, who felt that US kids wouldn't want to read a book about philosophers (read: he thought American kids were idiots). My copy is actually named Sorcerer's Stone as well, but since the book and movie are both called Philosopher's Stone here in Canada, I insisted on treating it as such. My next review will be Rabbids Go Home for the Wii, and after that I will review Harry Potter and the Chamber of Secrets for Gamecube, aka the Potter game everyone likes! I'm going to keep this pattern of doing a Potter game every other review so that my wonderful readers/viewers don't get too bored with the franchise. Do you have a favorite Harry Potter book? I read them all, but I thought only The Half-Blood Prince was an actually good book (I liked the rest too, but I'd call them more "fun" than "good"). I never saw the movies, so I can't comment on them. Stalvern wrote: Do you have a favorite Harry Potter book? I read them all, but I thought only The Half-Blood Prince was an actually good book (I liked the rest too, but I'd call them more "fun" than "good"). I never saw the movies, so I can't comment on them. Hmm, I'd have to say Deathly Hallows is my favourite in terms of quality, while Goblet of Fire and Order of the Phoenix are my favourites in terms of being emotional roller-coasters. Umbridge is one of the pettiest, most sweetly sadistic villains in recent memory.